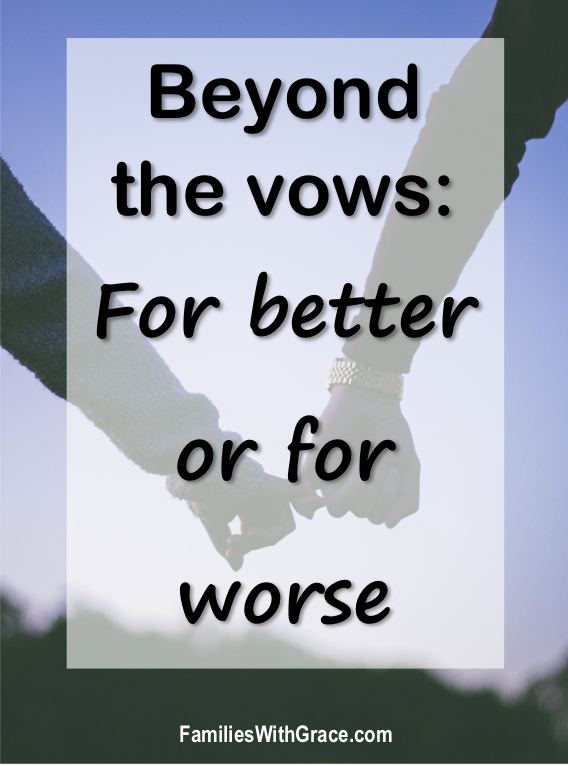 “Beyond the vows” is a series about what marriage relationships actually look like once the wedding is over and life happens. Learn more about the series and how you can share your own story here! 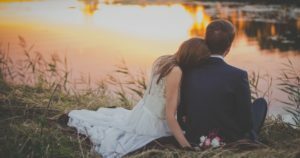 When my husband and I vowed to love each ’til death do us part in 1999, I was 20 and he was 22; we thought death was a long time in the future for us. It didn’t cross our minds that it would be something we’d face much sooner. 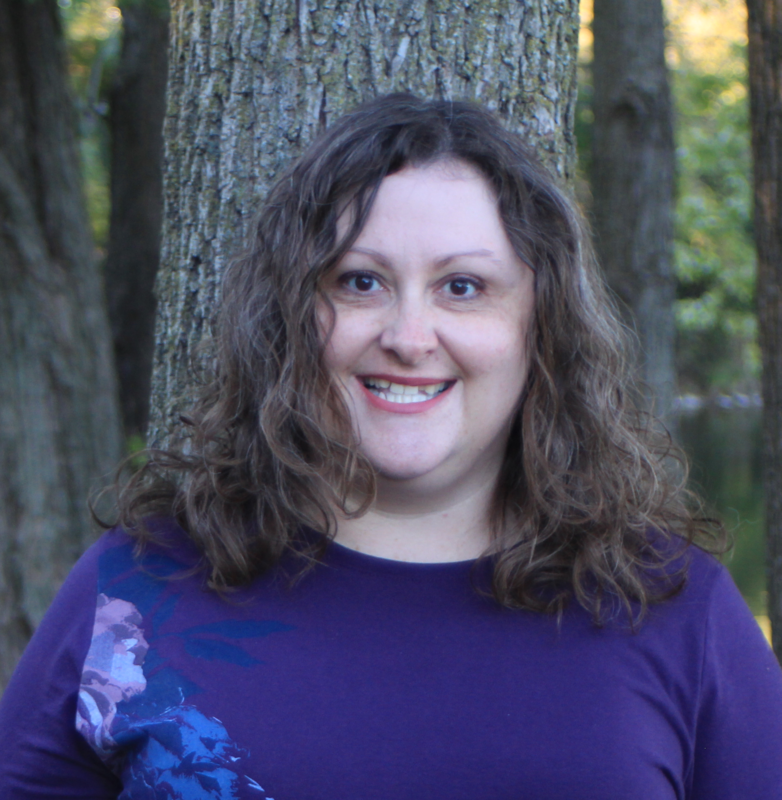 A few months later, we were traveling with my husband’s family and got carbon monoxide poisoning. It was so much that we ended up going to the hospital. I have wondered if my father-in-law hadn’t woken up thinking he was having a heart attack if any of us would have survived the night. I didn’t even wake up at the commotion, and my husband practically had to drag me to fresh air. When we got home later, a friend sent me a bouquet of flowers with a card that read, “I’m so glad you didn’t die.” While we sort of laughed at it, we also realized how blessed we were that our story didn’t end differently and the “’til death do us part” segment of our wedding vows didn’t happen before we’d even celebrated our first anniversary. Thankfully in the years since then, we haven’t had another near-death experience. We’ve both had some surgeries and such. My husband had a minor motorcycle accident but walked away with just a fracture in his shoulder and a couple of broken ribs. Our only other encounters with death have been through the loss of family members. 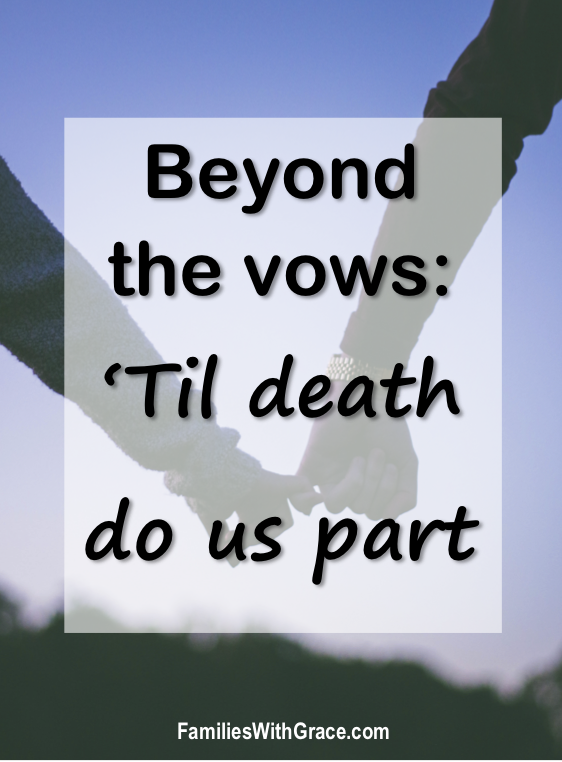 But what we’ve learned the very most through these 19 years is that “’til death do us part” means that we are together for the rest of our lives. It’s already been 19 years, which both seems like forever and just a few days. We’ve done a lot of living as man and wife. 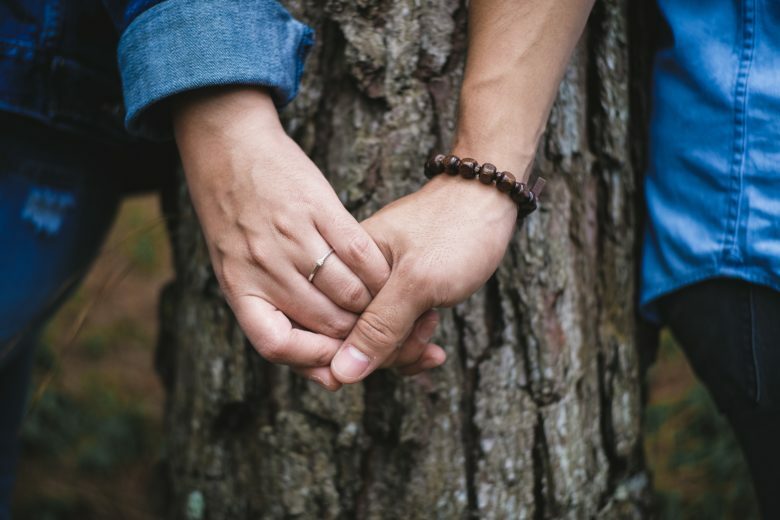 We’ve had our share of disagreements, but never once have we considered splitting up or divorcing. We haven’t ever discussed anything other than death parting us. 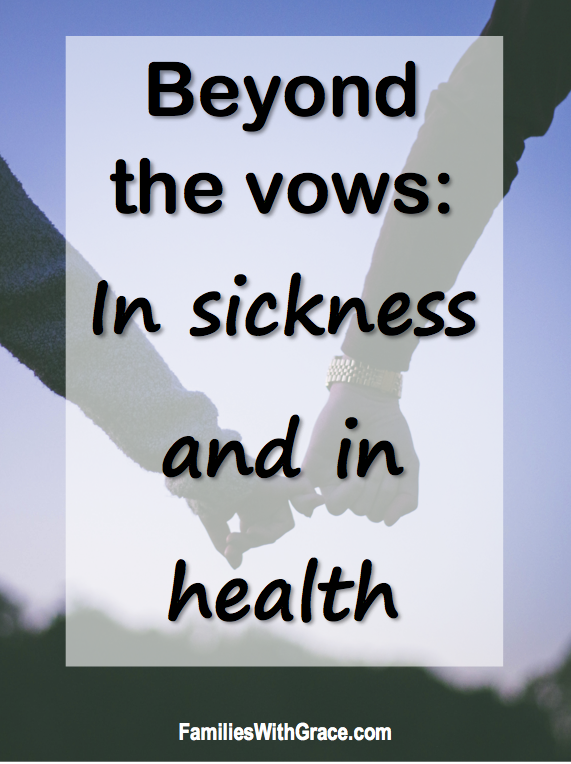 Honestly, I can’t even begin to get into my thoughts and fears about losing my husband because he is so much my other half that I don’t want to imagine life without him, and I dread the day that might come. Those same feelings, though, give me perspective. 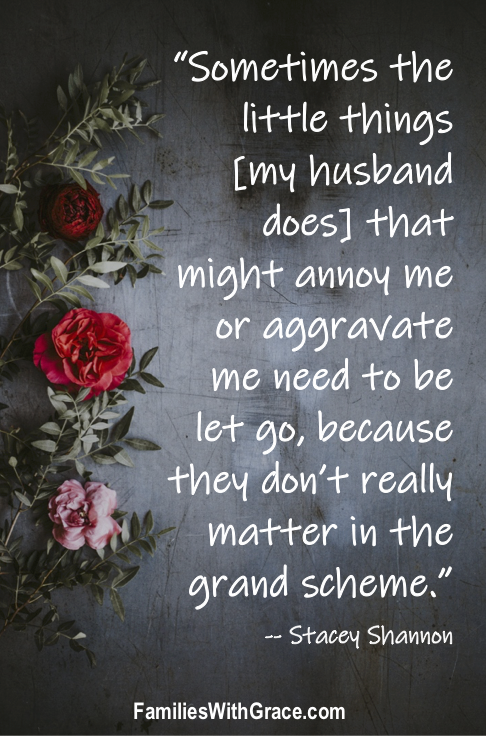 Sometimes the little things that might annoy me or aggravate me need to be let go because they really don’t matter in the grand scheme. One of the first times that lesson really hit home for me was on Sept. 11, 2001. We lived in the Midwest and nowhere near where any of the terror attacks happened, but I thought of all the people who said good-bye to their loved ones that morning never expecting it would be the last time they would see them. It inspired me to always say good-bye to my husband before he left for work and not leave for the day on a sour note. In all of the years since then that lesson has stuck with me. 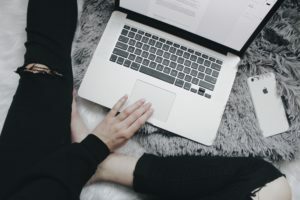 I’m so thankful that now my husband and I get to work from home together. I only see him off in the morning for the 25 minutes it take him to drop the kids off at school. On days when he has to go into his office, I miss him a lot. And while we do love each other and enjoy one another’s company, we do have problems that arise. We have differences of opinions. 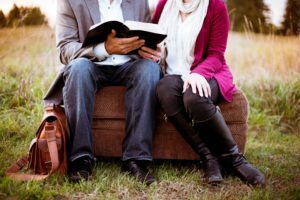 Those happen much less frequently these days than they did in the early days when we were first learning more about each other and adulthood, but disagreements happen. To stay together until death do we part, we have had to learn how to disagree. 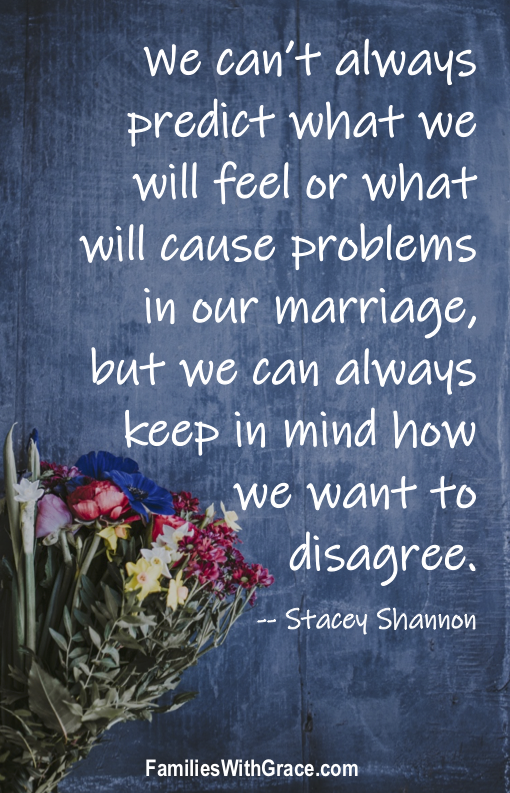 We can’t always predict what we will feel or what will cause problems in our marriage, but we can always keep in mind how we want to disagree. We have agreed to no name-calling, no empty threats of divorce and no hitting below the belt. I know the things that can most hurt him as he knows the same for me. We have learned it’s best to never take advantage of that knowledge and bring up hurtful things during disagreements. We do our best to focus on resolving the disagreement and not winning the argument or making the other person feel bad because we are angry. Are we perfect? No way! Do we ever get mad or irritated with each other over small stuff? Yep. We’re human. But we are also in this marriage ’til death do us part and so we find ways to compromise, apologize and move on. My husband and I have had the blessing of growing into full-fledged adults together. We’ve changed since those early days in our small college apartment. We’ve changed since we said our vows. We have grown and matured. We have come to know one another better. I hope and pray that ’til death do us part doesn’t happen until we are both old(er) and gray(er) and have lived 50 more years together. 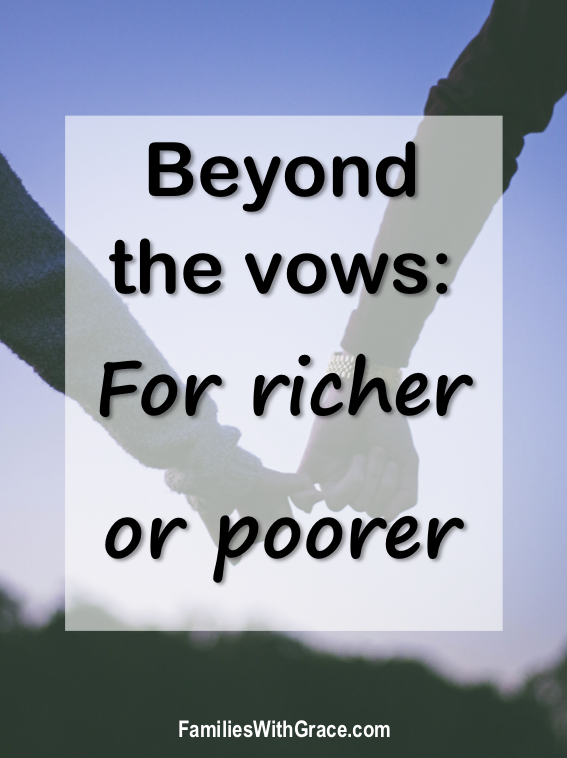 Learn more about the “Beyond the vows” series and how you can share your own story here!